The Ford Mustang will go down in the history books as being one of the most successful production cars. The Mustang is the type of car most automakers dream of launching. When Ford first introduced the Mustang in the middle of the 1964 model year, no one could have guessed the massive success it would immediately obtain along with the longevity it has had (never missing one model year in almost fifty years). Ford also never anticipated that the Mustang would be its future performance flagship car. Back in 1964 Ford’s performance focus was on its full-size lineup and the mid-sized Ford Fairlane. In 1964, the ultra low production Fairlane Thunderbolt was Ford’s ultimate performance car with an advertised rating of 425 gross horsepower (a figure very underrated – experts attest to the true figure being as high as 600 gross horsepower). The problem was Ford like most of the automakers at the time had its head clouded by racing. Ford lived by the old adage – "race on Sunday, sell on Monday" which meant Ford’s performance dollars were spent on performance engines and cars that could be used for racing. 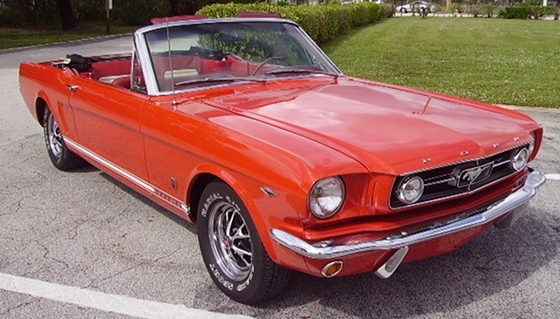 The Mustang back in 1964 was a niche car that was sold to youthful buyers. Ford didn’t see performance as the main mission of the the Mustang. When the 1964 1/2 Mustang was released a 101 horsepower 170 CID straight-6 was standard. Certainly the polar opposite of the 1964 Pontiac GTO – the first official muscle car which had a 325 horsepower 4-bbl 389 CID V8 as standard. However Ford did throw performance-oriented Mustang buyers a little red meat with a genuine performance motor – the 271 horsepower 289 (CID) High Performance (Hi-Po) V8. However even when a 1964 1/2 Mustang was equipped with the 289 (K-code) Hi-Po V8, it was a bona fide sleeper. The only tip-off of serious performance was a small "High Performance 289" badge on each front fender. For 1965, the roots of Mustang performance were born. Today the 2012 Mustang GT is Ford’s top mass produced performance car. 1965 was the first year for the Mustang GT, back then it wasn’t Ford’s top performance car but it put the Mustang on the path to where it one day would be Ford’s flagship. Unlike the 1964 1/2 Mustang with the Hi-Po 289, the 1965 Mustang GT was no sleeper compared to most performance cars back in 1965 the GT’s looks screamed performance. In other words if one wanted to buy a performance car that didn’t attract the attention of the law, the 1965 Mustang GT was not that type of car. All the Mustang’s finely sculpted lines were there but so were a host of other standard features. Decorative fog lights mounted in the front grill with a horizontal bar were standard on the GT and not available on any other Mustang model. The standard Mustang’s lower rocker panel molding was not available on the GT, instead the GT had sporty three lower horizontal stripes on each side of the car. Towards the front of each stripe were "M U S T A N G" silver lettering. And in case this was not enough to show this Mustang was a special performance edition there were "GT" badges and a decorative "GT" rear gas cap. Also the GT had an attractive hood chrome trim piece above the front grille. As much as the cosmetic appearance change with the GT package was enough to make the GT stand out from the standard Mustang, Ford didn’t forget the important stuff. Dual exhausts were standard on the GT. However unlike the dual exhaust system available on the standard Mustang, the GT’s had decorative trumpet style chrome exhaust tips with louvers. The tips did not exit below the rear valance panel but through it. Surrounding the area where the dual exhaust tips protruded through were chrome trim rings. The setup was not only of the most decorative dual exhaust tips design but back in the day one of the easiest ways to tell from afar if a particular Mustang was a GT. Unfortunately that’s not the case today, many standard 1964-1966 Mustangs have been upgraded to the 1965-1966 Mustang GT dual exhaust tip setup. Proof that that GT package was not just an appearance package, the GT came standard with Ford’s A-code 225 horsepower and 305 lb-ft of torque 4-bbl 289 CID V8. The A-code 289 had a 10.0:1 compression ratio. The A-code 289 like all other 289 V8s produced had a large 4.0 inch bore and a very short 2.870 inch stroke. Before dismissing the A-code all you need to know is that the curb weight of the 1965 Mustang was between 2,400-2,800 lbs so it’s easy to see that 225 horsepower went a long way on the GT. For most GT buyers back in 1965 the A-code 289 provided more than enough punch. Standard on the A-code was a 3-speed manual (synchronized) transmission with a floor mounted shifter. Optional was a 3-speed automatic transmission with floor shifter and a 4-speed manual transmission with floor shifter. For those who wanted or needed more, the 271 horsepower and 312 lb-ft of torque (Hi-Po) K-code 4-bbl 289 was optional. It had the same bore and stroke as the A-code but it had a higher compression ratio of 10.5:1. 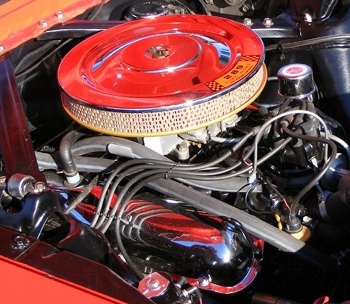 The Hi-Po 289 was essentially the precursor to the legendary 1969-1970 Boss 302 (CID) V8 – both were from the Windsor V8 family. The K-code 289 was setup for reliable high rpm operation (up to 7,000 rpm was easily and safely achieved) so it was the perfect motor for racing applications. Unlike the A-code 289, the K-code utilized heavy duty main caps, connecting rods with 3/8 bolts, screw-in rocker arm studs, high performance heads, heavy duty rods, heavy duty rod bolts, and other performance upgrades. The K-code’s Autolite 4-bbl carburetor had a maximum flow of 595 CFM versus the A-code 4-bbl’s maximum flow of 480 CFM. 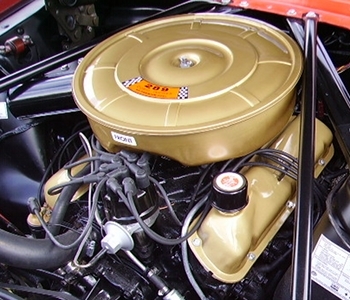 The K-code also had a smaller round free-flow chrome air cleaner assembly versus the bulkier more restrictive gold colored air filter assembly (which had a small black air snorkel) of the A-code 289. The K-code may have used the same crankshaft found in the other 289 V8s, however the best ones were hand picked off the assembly line and reserved for K-code use. The K-code 289 was most certainly the hot ticket for the 1965 GT. The K-code 289 equipped 1965 Mustang as tested by Motor Trend magazine back in the day achieved a 0-60 mph time of 7.6 seconds and a 1/4 mile of 15.9 seconds at 89 mph. The K-code 289 GT was no match for a 1965 Pontiac GTO equipped with the the (348 horsepower) Tri-Power 389 CID V8, however it was better than a good number of sporty 1965 model year cars. In fact, back in 1965 if a new car buyer wanted a smaller car with a very powerful small displacement V8 there was no better car to buy for the money than the K-code 289 equipped 1965 Mustang GT. A slightly modified K-code 289 was used by Carroll Shelby in the 1965-1967 Shelby Mustang GT-350 and in the Shelby 289 Cobra. The K-code 1965 Mustang GT could only be had with the 4-speed manual transmission with floor shifter. Ford also made sure the GT had improved braking and handling. The GT came standard with Kelsey Hayes type 4 piston caliper (non-power assisted) front-disc brakes which used an oversized single master cylinder. For manual and power steering equipped GTs a tight 16:1 ratio steering box was standard. The Mustang suspension was beefed up for the GT – a larger anti-sway bar was used. Stiffer rear leaf and front coil springs were standard on the GT. Though not a standard feature on the GT but a popular option were the 14×5 inch style steel wheels – very sporty looking wheels. On the 1965 Mustang all 6-cylinder equipped models received 4 lug wheels. 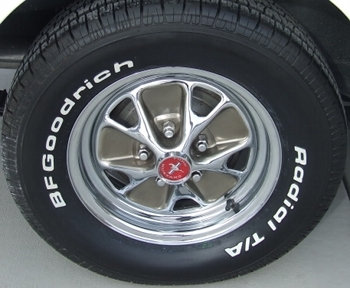 All V8 equipped models had 5 lug wheels – this was also the case with the GT, since it was equipped with either an A-code or K-code V8 it came standard with 5 lug wheels. 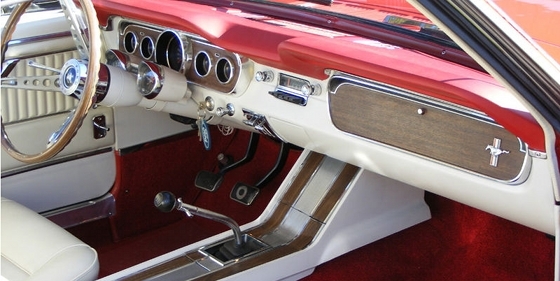 The interior of the GT was the same as what was found in any other 1965 Mustang, most of the interior options on other Mustangs were also available on the GT. The only interior items that were exclusively found on the GT were the fog light switch, a unique passenger side glovebox design, and a five round gauge instrument dash cluster. This round gauge cluster that included a round speedo was leagues better than the cluster found on all other 1965 Mustangs which had the mandatory horizontal speedo. Interesting to note a popular option on the GT and other 1965 Mustangs was the Rally Pac – a round tachometer and clock that were attached directly to the Mustang’s steering column. And just like all other 1965 Mustangs, bucket seats were standard on the GT. All three Mustang body styles (coupe, fastback, and convertible) could be ordered with the GT model. Though the coupe and convertible were sharp looking in GT form, the fastback with its sleek roofline seemed like the perfect match for the mystique the GT presented. And adding to the appeal of the fastback were the louvered trim piece behind each side window. The downside was the fastback had a large blind spot between the side windows and the rear fastback glass (right where the louvered trim pieces resided). Shelby on the 1966 Shelby Mustang GT-350 fixed this problem by replacing the louvered trim pieces with clear glass pieces. 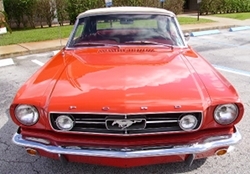 The GT continued to be the Mustang’s top performance model through 1968. By 1969 it was overshadowed by the Mach I and Boss Mustangs. For 1970, the GT didn’t return. The K-code would continue to be a GT option through 1967 – for 1968 it was gone since it had been replaced by more powerful larger displacement V8s. The Mustang GT would return again in 1982 to much fanfare as the top dog performance Mustang – and it has continued this role with much success the last 30 years. Ford certainly had no idea what it was starting when it first offered the Mustang GT in 1965, forty seven years later the Mustang GT is still going strong using the same formula of a flashy appearance package, a powerful V8, great handling, and fantastic braking – all of which are still found in a rear-wheel drive configuration. I don’t think anyone can pay the 1965 Mustang GT a better compliment.